Home | Blog | What’s the Difference Between Spring Water and Purified Water? 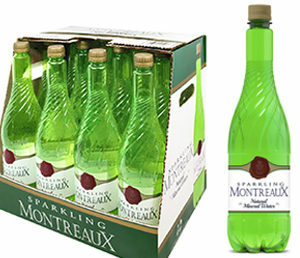 As a 106-year-old brand, and one of the top 10 bottled water companies in the country, we earned our reputation as an industry expert. 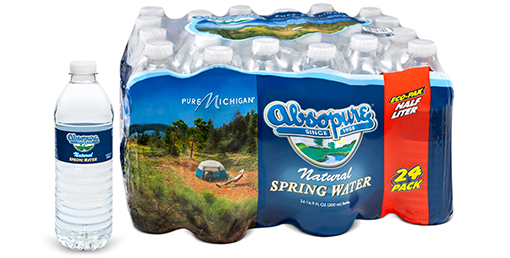 We’re committed to providing customers with the highest-quality product and largest selection of bottled water, including Natural Spring Water, Steam-Distilled Drinking Water, Purified Drinking Water, Natural Sparkling Mineral Water and more! 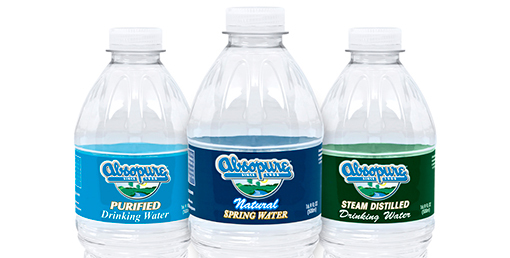 To help you discover which type of Absopure water suits your tastes, we’re describing the differences between our Steam-Distilled Drinking Water, Natural Spring Water and Purified Drinking Water below. Unlike tap water, which is regulated by the Environmental Protection Agency (EPA), bottled water is regulated by the Food and Drug Administration (FDA) and held to high federal and state health standards. All of our bottled water products meet and exceed federal and state health standards, and are tested hourly to verify they are of extremely high quality. Spring water comes from an underground source from which water naturally rises to the surface. Although the water must rise to the surface on its own in order to be classified as natural spring water, we collect spring water at the source. 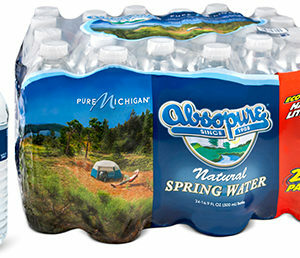 Our spring water is then passed through multiple stages of filtration to remove particles and other unwanted elements. Our filters act as cleaning agents and ensure only water passes through. It’s important to note that we don’t alter our spring water in any way. Once it passes through our filtration system, it still has all the natural minerals and qualities that gives our water its great taste. If there is an underground source of water that doesn’t rise to the surface naturally, and needs to be extracted, the FDA classifies it as artesian well water. What is steam-distilled drinking water? Steam-distilled water is one of the cleanest forms of purified water. Put simply, distilled water is boiled and turned into a steam before it’s converted into water again. Once the water converts from a liquid into a gas, heavy solids are left behind and the steam is moved to a separate chamber where the water particles are condensed back into a pure, clean liquid state. Our purified water is initially carbon filtered and then processed by a reverse osmosis purification unit. During the reverse osmosis process, water is put through a semi-permeable membrane, where only the purest water molecules are collected—unwanted particles move through the system and are discarded. The result is a refreshingly clean drinking water. 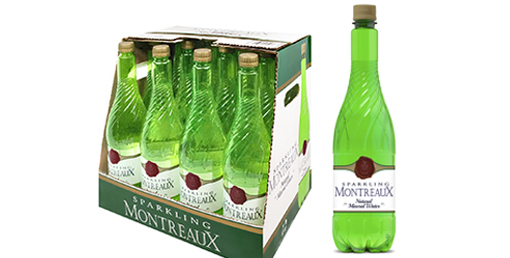 All of our non-carbonated waters also go through a multi-barrier system before being bottled. This process includes a one-micron absolute filtration, ultra-violet light treatment and an ozonation process to ensure every bottle is clean and safe to drink our delicious water from. We hope this gives you more insight as to how much care we take to produce high-quality, great tasting drinking water. Now that you know the difference between our Steam-Distilled Drinking Water, Natural Spring Water and Purified Drinking Water, we encourage you to try them all and discover which type of Absopure you like best. Now it’s your turn to decide which water you like best! 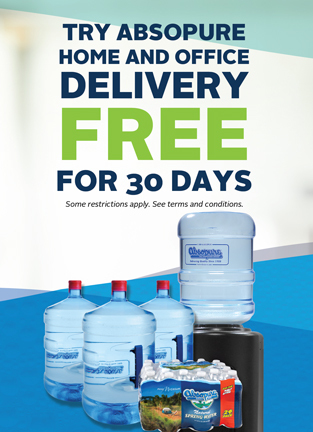 Whether it’s home delivery or office delivery, let Absopure deliver refreshing water directly to you.